Any homeowner's dream pool. A concrete pool is absolutely the best choice for a customer that is looking for that special pool designed just for them. These pools carry a lifetime structural warranty and can be specifically designed for any backyard. 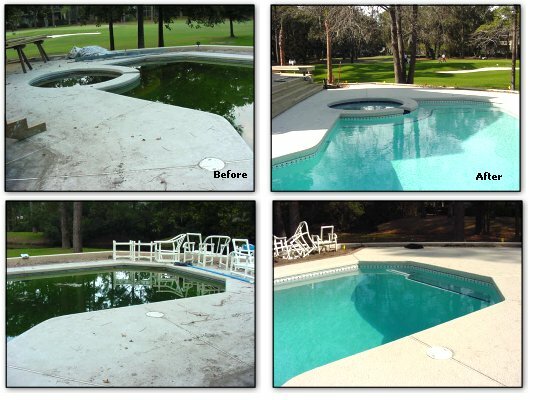 Unlimited shapes and sizes are the main factor in choosing a concrete pool over a vinyl or fiberglass. We can make these pools as large as you want, or as small as you want. In many cases we can actually hand the homeowner a can of spray paint and have them outline in their yard what they want. We then can make the pool to fit that shape! With over 200 tile and coping samples to choose from there is no limit to the exceptional taste that these pools carry. Specialized items can include tanning lounges, spas, vanishing edges, kidde pools, wave pools, In-Pool bars and islands. There is no limit to your imagination when you choose this hand crafted piece of perfect. Concrete pools are by far our most prized posessions. We as homeowners and builders invest a great deal of time and thought into designing that perfect little Oasis that we can retreat to in our own backyard that is private and still allows us to get away from the everyday stresses of life. We understand you may have just purchased a home, and the pool was let go by a previous owner, or you just need a new facelift for your pool. We are the company that can provide that to you. There are unlimited possibilities that can be accomplished by just calling and setting up your FREE site review appointment to assess the condition of the pool and create the new appearance you are searching for.